After purchasing a Synology DS-413J to replace my DNS-323 device, I wanted to repurpose the old NAS into a backup server. In my mind, I pictured using a Richcopy or Robocopy scheduled task from a Windows machine to talk to the 2 devices. As it turns out, both the NAS’s can speak the same language (linux) and there’s a handy little tool that takes a couple steps to do, but is well worth the effort if you want re-purpose a DNS-323. DNS-323 instructions: You need Funplug! -After reformatting your DNS-323 device, download the fun_plug file and fun_plug.tgz and place them on the ‘volume_1’ share of your DNS-323. That’s the most condensed version of Funplug I can give you guys, there’s lots of more minute details, but for now that will do to get what’s necessary: RSYNC and SSH services on the DNS-323. = This is the IP Address range of your local network, the above example is for a standard Class C network, make the appropriate changes to yours. The /24 denotes the type of subnet mask you’re using. /24 pertains to a standard 255.255.255.0, this typically will fit your home network. Otherwise, here’s a cheat sheet on subnets. = This user has to be created through the DNS-323 web server. You can stick with the standard ‘Admin’ account if you want, but for security purposes it’s a good idea to have a separate one for backup jobs. = is the path on your DNS-323 of where you’re going to backup your data. The command is just one line, username:password. This is where you fill in the username and password created in the web interfaced of your DNS-323, and specified rsyncd.conf. To see if the Rsync service has been started properly. 4. 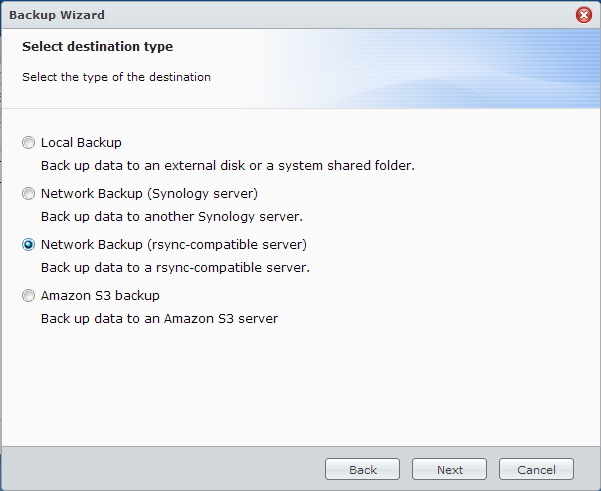 After logging into DSM, goto Backup and Restore, open the backup wizard to open a new job. For the destination type, choose an RSYNC-compatible server. After you hit, next DSM will test the connection for you. As long as you’ve configured the RSYNC on the DNS-323 and started the service, DSM should pick it up. After you choose your backup selections, make a schedule; set it and forget it. *Rsync is not hailed for speed, but reliability. My suggestion is to copy contents to the destination DNS-323 and then configure RSYNC to get changes. On average RSYNC only travels at around 2-4MBps. Thanks, this was awesome and easy! I have used your method to backup a Qnap to a DNS-323. A couple of errors in your method. 1. The ‘secrets’ file is ‘rsyncd.secrets’ in the .conf file but your instructions say to create rsyncd.secret. 2. The ‘pid file’ entry in the .conf file. Remove the space after the equal (“=”) sign or you will get an error. The files copied to the DNS-323 remain with owner = backup_user. This is because backup_user is not an administrator. Any idea how to fix this? 2. My DNS323 was able to take it with the space before and after the “=” sign. Could be a different version of busybox that accepts it. For the Backup_user account, I had to create this account on the Web interface of my DNS323 in order to get the backups to work properly. And yes, I had to give backup_user full read/write access in order to get the rsync to function. Firstly, thanks for the guide. It had been really helpful for a complete linux newbie. Was wondering if you could help. I am at the step to start rsyncd.sh but I’ve got the following error. Is there any way to confirm if the rsyncd.conf was done properly using vi? Thank you! my backup between my synology and dlink 323 is good ! 2. While removing the space after ‘pid file =’ in the rsyncd.conf file works, a ‘better’ solution is to modify the rsyncd.sh file as follows. After a reboot, rsync will not start, and the error is “/ffp/var/run/rsyncd.pid stale”. It seems the /var/run directory is not cleared after a reboot, which I believe is supposed to happen. Therefore there is a stale rsyncd.pid in it that prevents rsync from starting. Any advice, anyone? You should be able to SSH into your DNS323, navigate to the /ffp/var/run directory and just delete that rsynchd.pid file out of there. Otherwise, just make sure your rsync files look the same as above. rsync: write failed on “/home/root/packages/automake-1.10.1-2.tgz”: No space left on device (28).